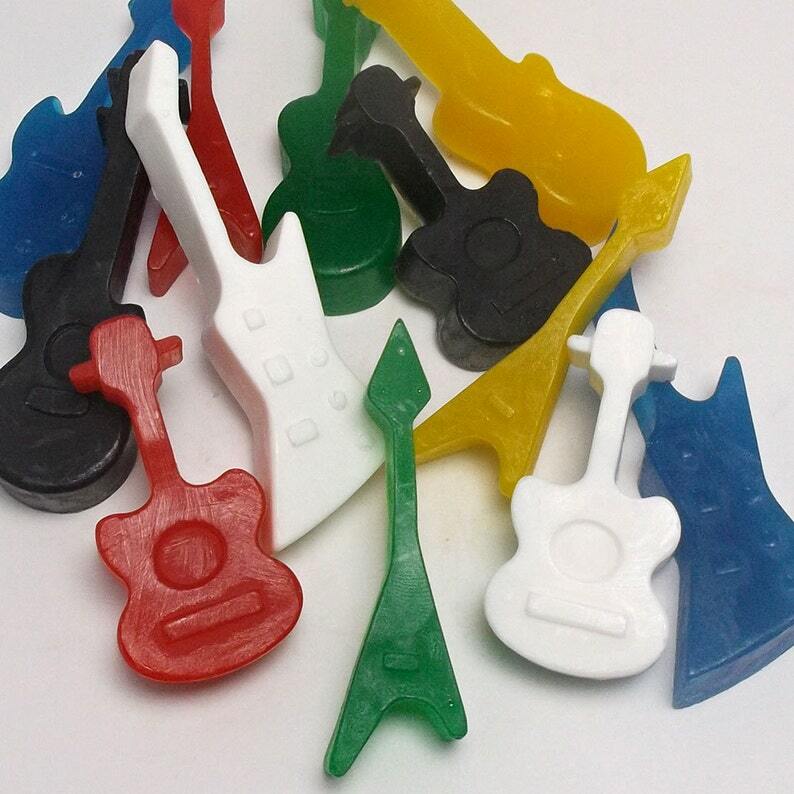 Guitar soap favors are awesome party favors for a girl or boy rock star party or music themed party or baby shower. Guitar soap is unique, will add to your decor, and are sure to be a hit at your rock and roll party, baby shower, or bridal shower. Includes favor tags. Set of 10. Assorted guitar shapes and sizes. 1) Your choice of tag. Choose a tag from the 5th picture. Champagne - Just like champagne or the fizzy bubbles in ginger ale. Cherry Almond - A sweet mix of cherries and almonds. Dreamsicle - Orange and vanilla cream, just like an orange creamsicle. Energy - Blend of citrus; grapefruit, lemon, lime, cucumber, jasmine, pineapple, blackberry, champagne. Ingredients: Glycerin (kosher, of vegetable origin), Coconut Oil, Palm Oil, Safflower Oil, Purified Water, Sodium Hydroxide (saponifying agent), Sorbitol (moisturizer), Sorbitan oleate (emulsifier), Oat protein (conditioner), Fragrance, Titanium Dioxide, Color/Iron Oxide/Mica. May contain Lake/FD&C/D&C colorants.